The DTA65A2 series of AC DC desktop power supplies provides up to 65 watts of output power in a 4.25″ x 1.87″ x 1.18″ package. This series offers single output models ranging from 5V to 48V with an input voltage range of 90-264VAC. All models are RoHS compliant, and models above 5V are Energy Level VI compliant.This series has a high efficiency of at least 89% as well as over load, short circuit, and over load protection. The DTA65A2 series has UL 60950-1, CSA C22.2-No. 60950-1, TUV EN60950-1, and CB IEC 60950-1 safety approvals. 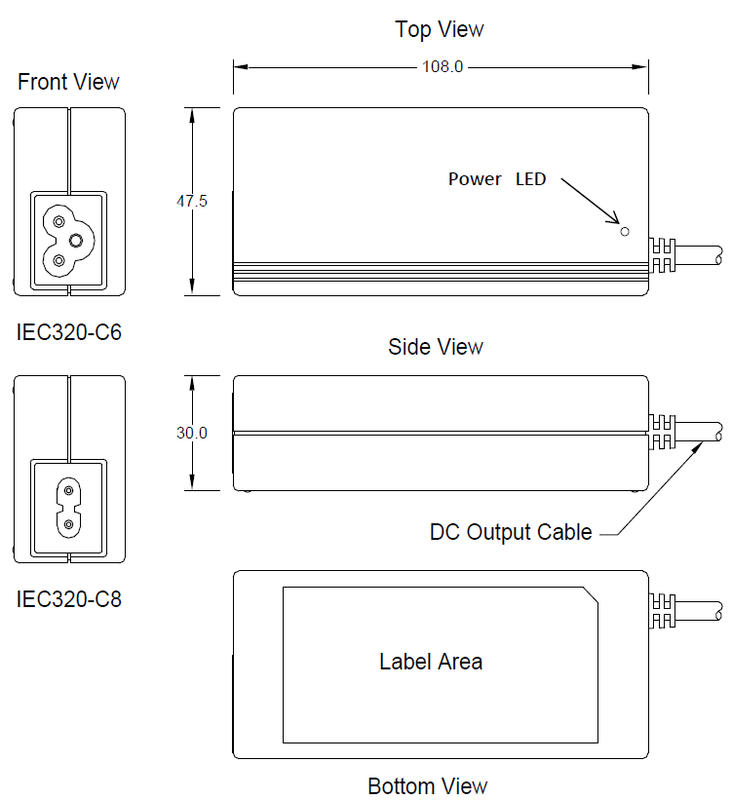 Two AC inlets are available: 3-Pole IEC320-C6 and 2-Pole IEC320-C8. Please call factory for order details. Dimensions: 4.25" x 1.87" x 1.18"
(2) Ripple and noise are measured at oscilloscope 20MHz bandwidth by a 47uF electrolytic capacitor and a 0.1uF ceramic capacitor in parallel at output connector.